2019 Tata Harrier SUV will be the next big launch from Tata Motors in the first quarter of 2019. The bookings for the new Tata Harrier SUV are open from today and the SUV can be booked at just Rs. 30000 INR. The company already created teaser videos of the new Tata Harrier SUV going for torture test and water wading capacity. We have seen only parts of the SUV and not full in flesh. A recent image from Tata Motors Crash test department shows a rear three-quarter view of the all-new Tata Harrier. This could be purposely done by Tata Motors to lure the customers. The picture shows markings on the vehicle and a scale on the door that is typically used for the crash test. The orange colour foreground and enough lighting on the SUV just ensure that this comes from a crash test facility. The image reveals all LED tail lamps and not so attractive 17-inch rims. It is interesting to notice that the rear end gets a silver lining between the tailgate and the body cladding. Beige colour seats and an infotainment display screen are another few highlights of the car. Body coloured mirrors with indicators and black B and C-pillar makes this SUV roof floating just like Hyundai Creta. As per the Tata Motors officials, the new Harrier SUV will retain 80% of its concept design, H5X to production variant. The SUV is based on the OMEGA platform and will be powered by a 2-litre diesel engine sourced from Fiat. Tata Motors re-badged it to KYROTEC with their engine control module. The new SUV from Tata Motors will get 6-speed automatic transmission sourced from Hyundai and 6-speed manual transmission developed in-house for OMEGA platform. The 2.0-litre engine produces 140PS in Jeep compass. The SUV shares underpinnings of Land Rover Discovery and will come with first 5-seater layout, Tata Harrier and then 7-seater layout with a different name. 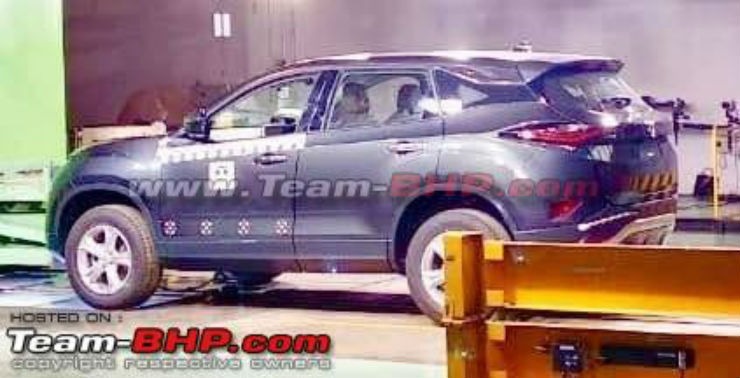 There are also rumours about Tata Motors will come up with micro-hybrid technology in this SUV that will improve the fuel economy of the vehicle. All new Tata Harrier SUV will come with different terrain modes and will come with 4 wheel drive as well as 2 wheel drive options. All LED headlamps will be another first-time feature from Tata Motors in this SUV. Tata Nexon SUV success gave Tata Motors a confidence on Indian customer and the company will price this SUV very competitively around 12-14 Lakhs INR range.